Revolutionary. One device designed for all jobs. Browsing, presentations, typing, mobility and working with a partner. The simple idea of installing a dual-TFT on the front and rear is to revolutionize using a Windows PC. 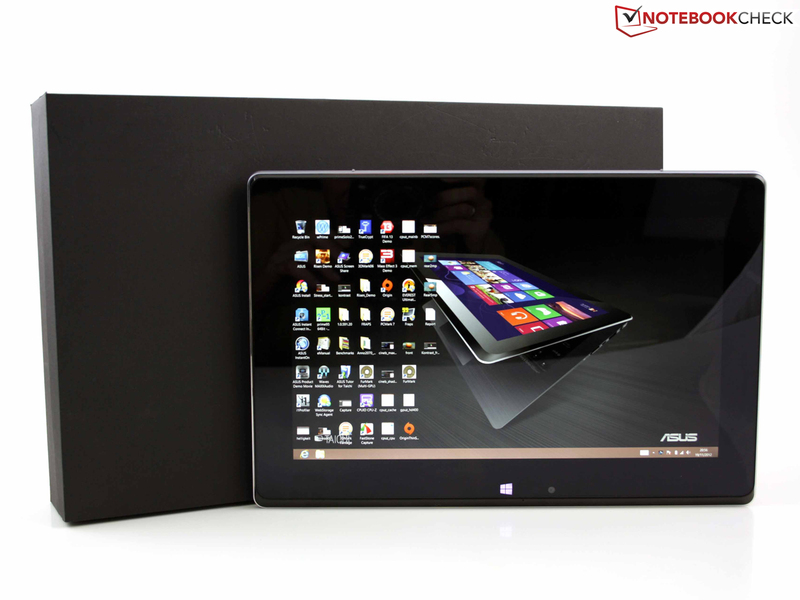 Asus Taichi 21: Ultrabook and Windows tablet in a single device. Will the multipurpose strategy be successful? Does the Taichi have what it takes to be revolutionary? The technical idea is simple. 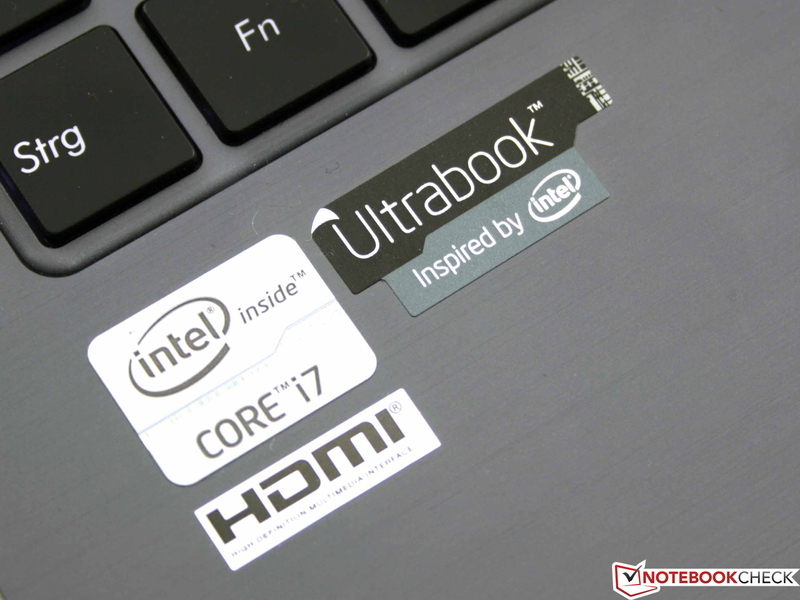 Take a subnotebook that fulfills ultrabook criteria and add a touchscreen on the display's back. Adapt a few details here and there for good handling and something unique is created. The seemingly brilliant idea: No buyer has to part from fixed notions of how to use a normal laptop; the Taichi can still be used as a normal laptop. 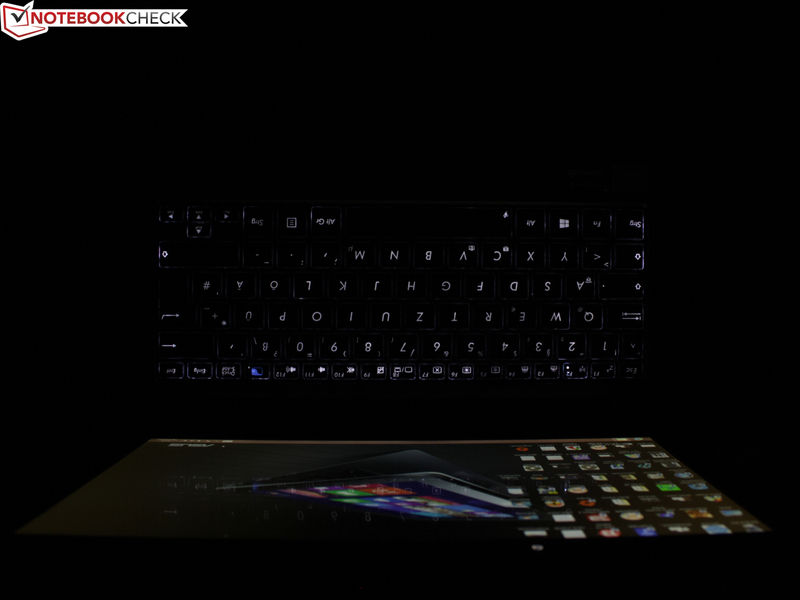 By and by, the user will explore and learn to appreciate the obvious tablet mode as well as the mirror and dual-screen mode - at least according to the engineers from Asus. While the competition is busy with dock-screens (HP's Envy X2, Acer's Iconia W510P), flip-frames (Dell's XPS 12), slider-mechanisms (Sony's Vaio Duo 11, Toshiba's Satellite U920t) and 360-degree-swivel lids (Lenovo's IdeaPad Yoga), the Taiwanese manufacturer is avoiding special mechanics in favor of this simple technical solution. 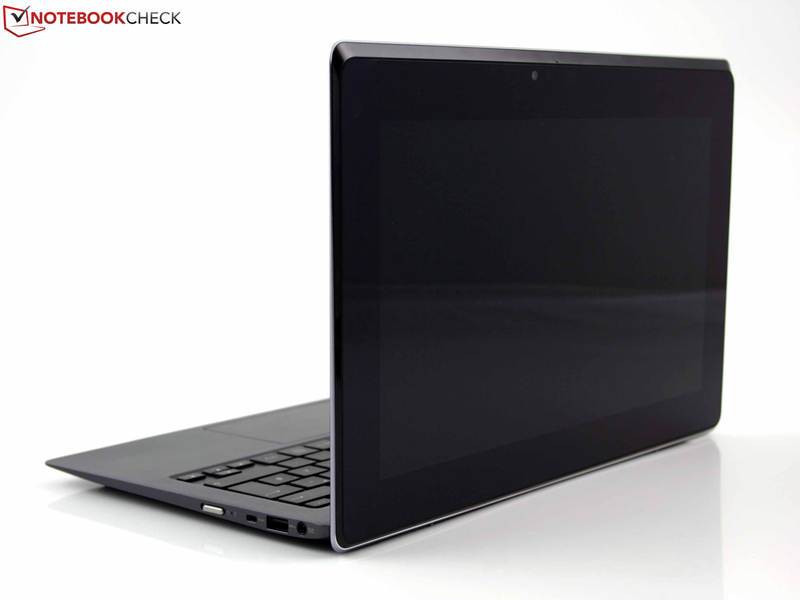 The Taichi 21's casing is an aluminum unibody similar to that of the ZenBook UX21A. The emphasis is on "similar" because we are dealing with a modified unibody. The pointed wedge-shape that gave the UX21A its unique looks is now less pronounced. 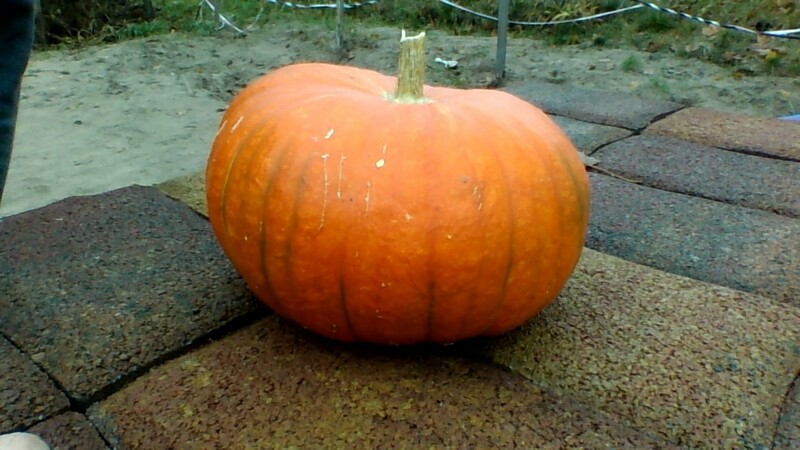 The base gradually slims toward the front. 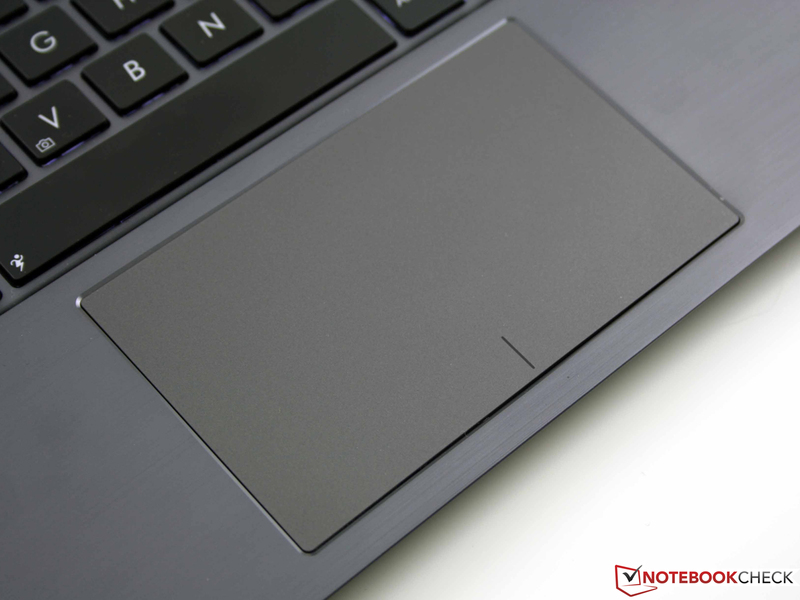 Striking, and in contrast to the ZenBook, is the fairly thick lid that protrudes by about three millimeters (~0.12 inches) around the base's sides. It is framed by an aluminum rim and allows the hands to open and close the lid conveniently. A continuous rubber lip on the TFT bezel cushions the brunt of closing. 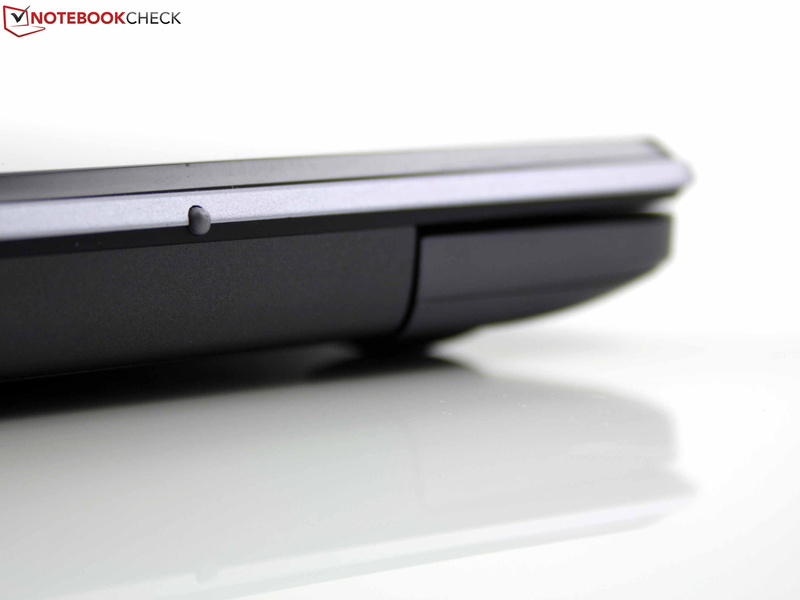 The lid is held magnetically to the chassis in tablet mode. The magnets' low force cannot prevent it from opening in an upside-down state. This is of no concern because the fingers are forced to grasp the Taichi 21's base unit when holding the lid due to the cover's larger size. The continuous hinge is fitted very tightly in the casing. However, only one hand is needed for opening because the base unit's front is weighed down by the battery. From an opening angle of 100 degrees, the lid slides with two mini feet under the base unit and lifts it by a few millimeters. There is a risk of scratching the aluminum frame, but it should withstand that. The base's stability is first-rate. No matter whether the top or bottom, nothing dents or warps. The dual-screen lid's stiffness is a bit weaker for construction reasons. It can be warped using both hands. 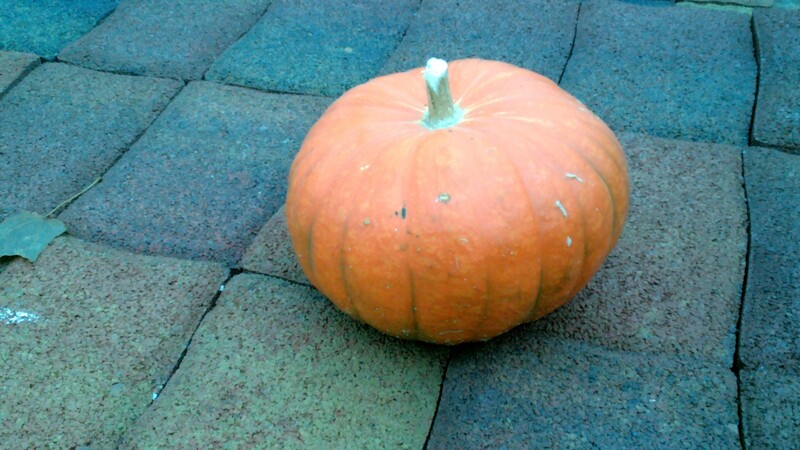 However, it does not warp at all when we pick it up at a corner. The inner screen (non-touch) is comparatively insusceptible to touch. The same is true for the touchscreen on the opposite side. 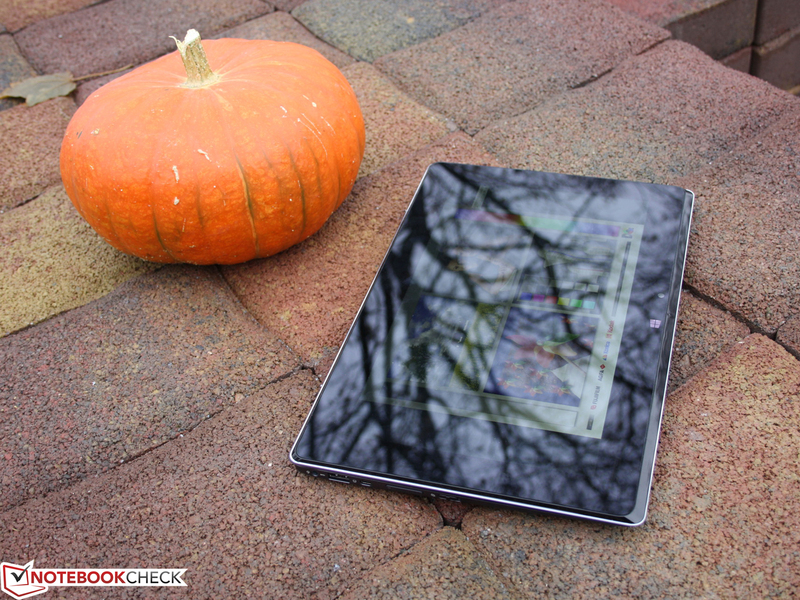 Potential buyers should not expect the high pressure resistance of a premium 10-inch tablet. The space conditions of the slim, 18 mm chassis (~0.71 inches/thickest part incl. feet) contradict installing many ports. Then, the aesthetic aspect has to be considered. Clusters of interfaces would ruin the looks. Consequently, the Taichi's connectivity is limited to merely 2 USB 3.0 ports, a micro HDMI, mini VGA (via dongle) and a headphone jack. 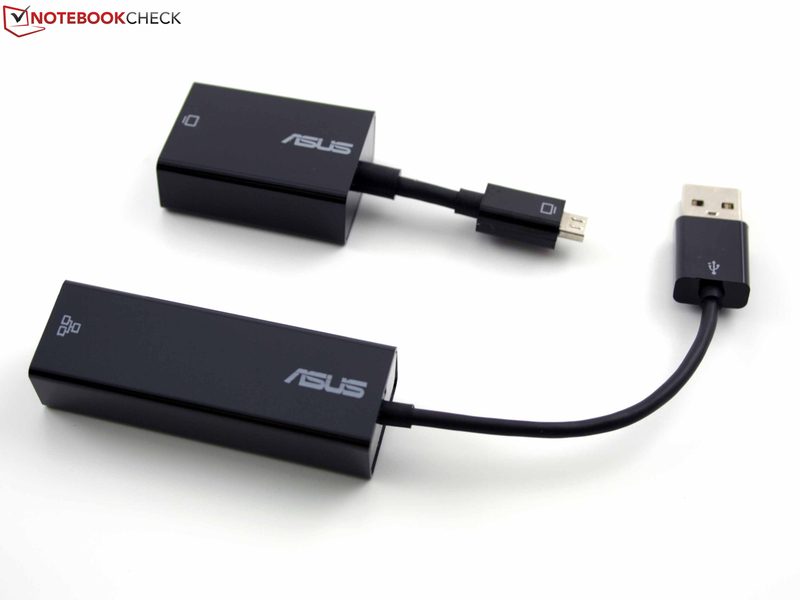 Asus includes a mini VGA to VGA D-sub and a USB to RJ45 adapter. The network card is not built into the device; instead it is a USB-only solution. However, the USB dongle only supports 10/100 Mbit Ethernet. 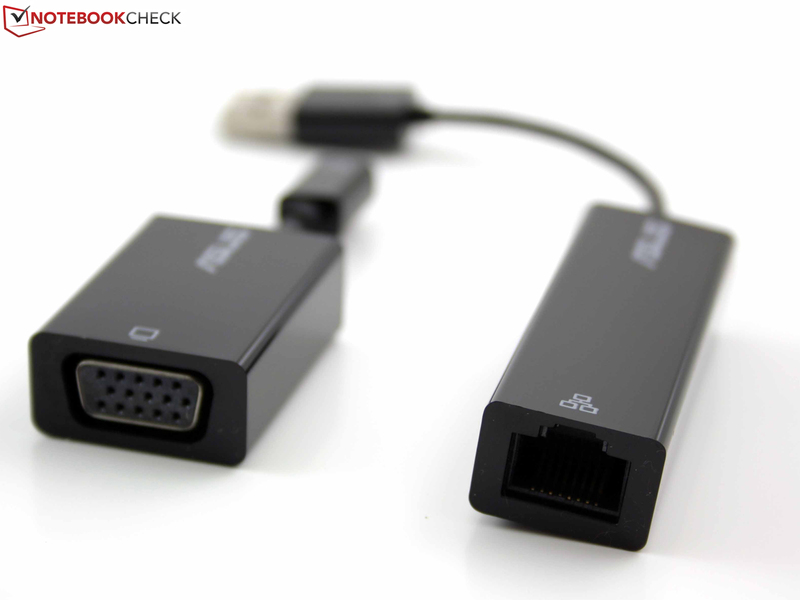 An adapter for micro HDMI to HDMI type A, 19-pin is available for a few Euros in retail. A LAN card is not installed, but Intel's Centrino Advanced-N 6235 Wi-Fi adapter supports the latest draft-n standard. Consequently, the Taichi also supports Wireless Display (TFT, TVs via radio control, must be supported or WIDI box). Bluetooth 4.0, the low energy version that is even employed in devices with button cells, is also integrated. Asus does not have a 3G version of the Taichi in its range. 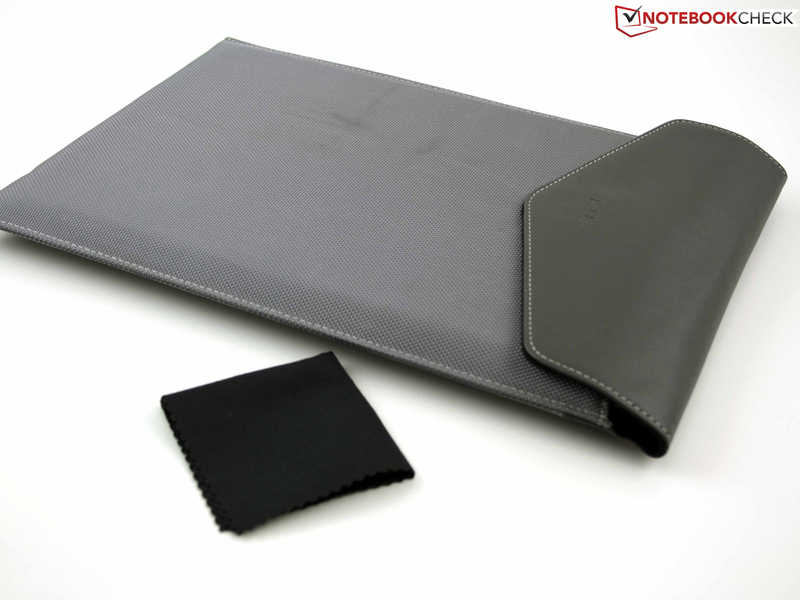 In addition to the VGA/Ethernet dongles and quick start guide, a high-quality slim pouch composed of imitation leather and robust textile is in the box. Recovery DVDs for Windows 8 64-bit are not included. The aluminum digitizer pen will prove to be a handy addition. 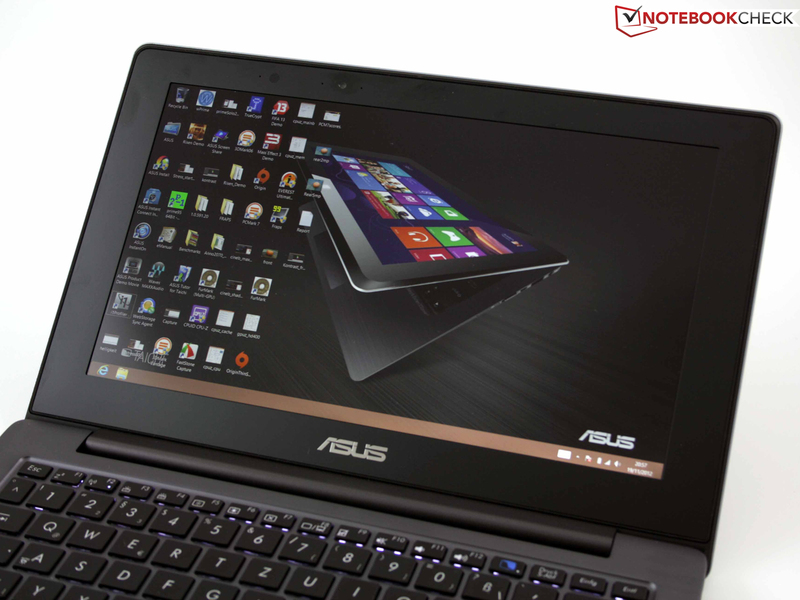 Asus includes a base warranty of 24 months on its ultrabooks as well as on the Taichi (including pick-up & return). If a longer period is needed, a warranty upgrade to three years can be added for approximately 90 Euros (~$116). The specs sound quite good: 0.9 megapixels (interior laptop), 5.0 megapixels (outer tablet). Regrettably, the tablet mode cannot be used as an oversized camera viewfinder; a camera on the Taichi's bottom would have been required for this. Thus, only the tablet's front-facing camera is available and the user has to inconveniently sneak out of the picture. Sony solves this much better in its Duo 11 (real rear-facing camera in tablet mode) and the picture quality is also superior (at least in bright daylight). Although one camera is high-resolution (5 MP) the pictures are pale, faded and the outlines are blurred. The keys are lowered in a recess that is part of the base unit's aluminum top. Pressed keys are level with this grid. The wrist rest also provides enough room for big hands. 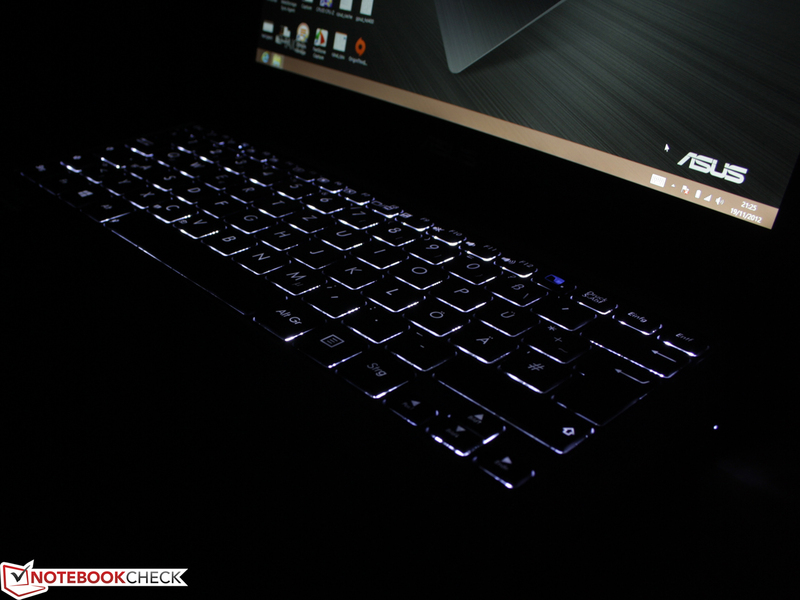 The small but separated arrow keys can be found in the dark. 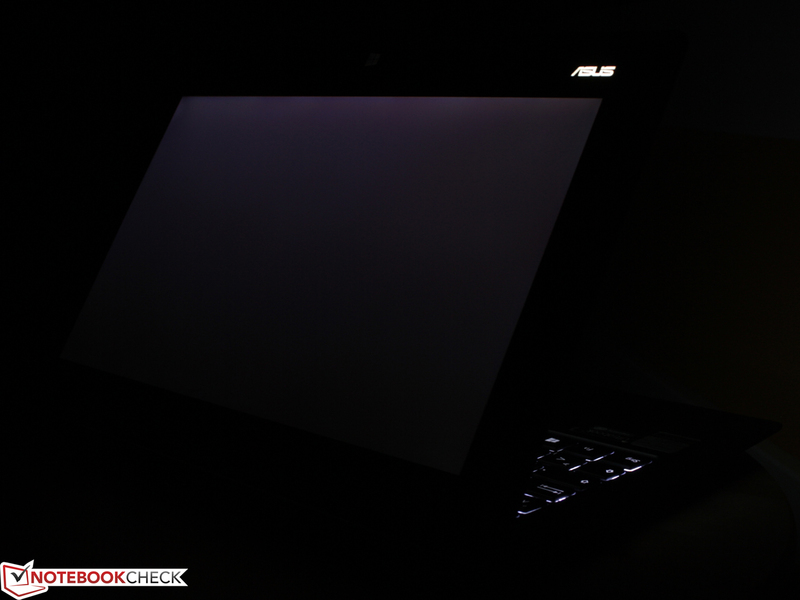 However, this is not necessary because Asus has implemented a three brightness level backlight. 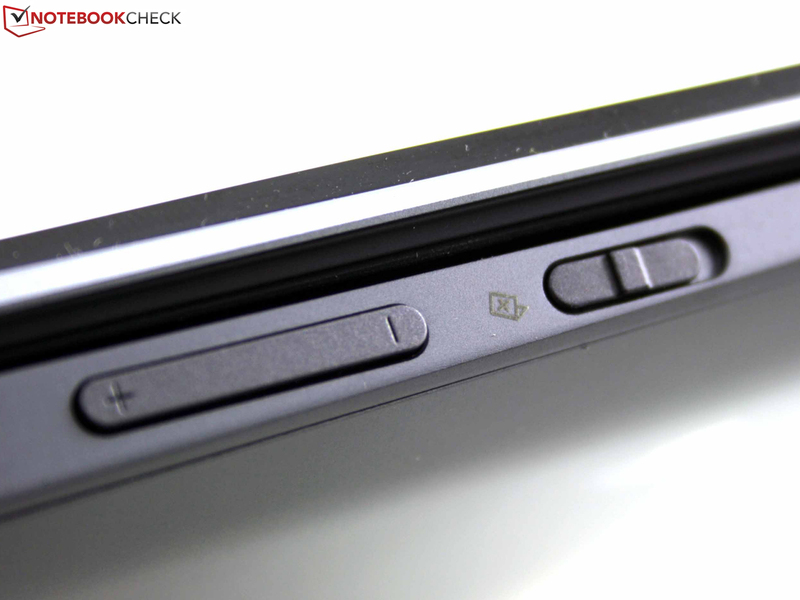 The power button is no longer located on the keyboard like in the ZenBooks, but on the casing's right. This seems logical since the Taichi 21 will also be powered up in tablet mode. The keys are completely flat, without a concave recess. We liked the clear pressure point and firm stroke right away. The sufficient key drop of nearly three millimeters (~0.12 inches) alongside the crisp pressure point provides a pleasant and immediate feedback. The keys feature a sleek surface which successfully thwarts fingerprints. The marks for touch-typists are very palpable. The multi-touch pad with a diagonal of 12.1 centimeters (~4.8 inches) is bigger than in some 15-inch devices. It is matte (no fingerprints, good gliding traits) and the used finger can distinguish it well from the aluminum surroundings. 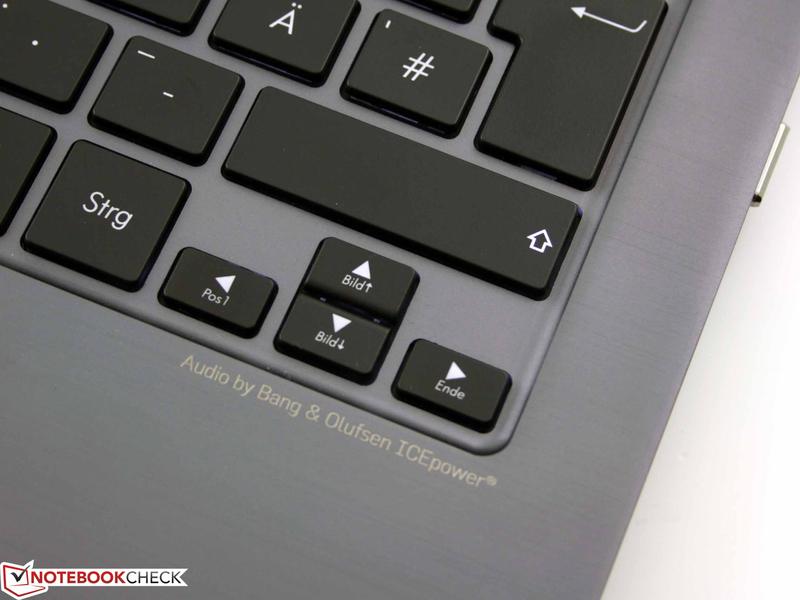 A feature of the clickpad is a "left mouse key" beneath the entire area of the sensitive surface. The pad's surface is pressed down one millimeter when clicked (left mouse click, also double-click). The right and left mouse buttons are in the front area. The pad is not touch sensitive above that. This is agreeable since this prevents an irritating cursor movement. The mouse buttons’ drop is decent (two millimeters/~0.08 inches) and the pressure point is crisp. The click noise is quite loud and will, for example, quickly get annoying in the library. The only real point of criticism is the high force needed and the too short key drop when clicking on the pad's center. Tai-Chi is the name for Chinese shadowboxing or a national sport with a focus on kinetics and self-control. The idea fits the device because if you open yourself to this technology, you will leave the worn out paths of typical laptop usage. We do not want to describe these scenarios in-depth because Asus has created a very good Taichi website. 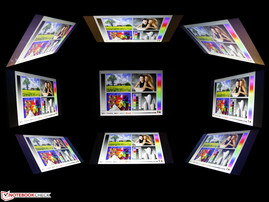 The usage is presented in video and pictures: taichi.asus.com. We only want to say this much: While the mobile tablet mode is obvious, the uses of the scenarios sharing (mirror-mode) and conference (dual-screen mode) are less clear. We liked Asus' Screen-Share tool: drag a picture or PDF into the screen and it is immediately displayed on the touchscreen. The viewer does not see the desktop. The extended desktop over both TFTs is also interesting because it enables two people to use it for the first time. One person at the keyboard and touchpad and the other can use a finger or stylus on the multi-touchscreen. The application fields of the latter scenarios will certainly be restricted. Principally, the use in presentation mode, where the Taichi is placed between two users facing each other and also operated, is questionable ergonomically. 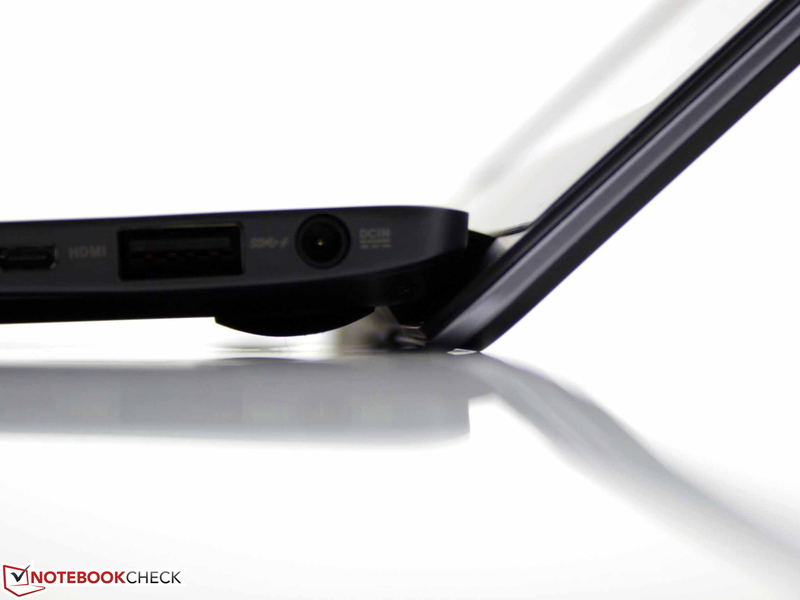 Although both screens feature very good viewing angle stability, both users are forced to look down on the compact 11-inch screen from a slanted angle because of the perpendicular position. The device would normally be placed on a low desk or conference table. 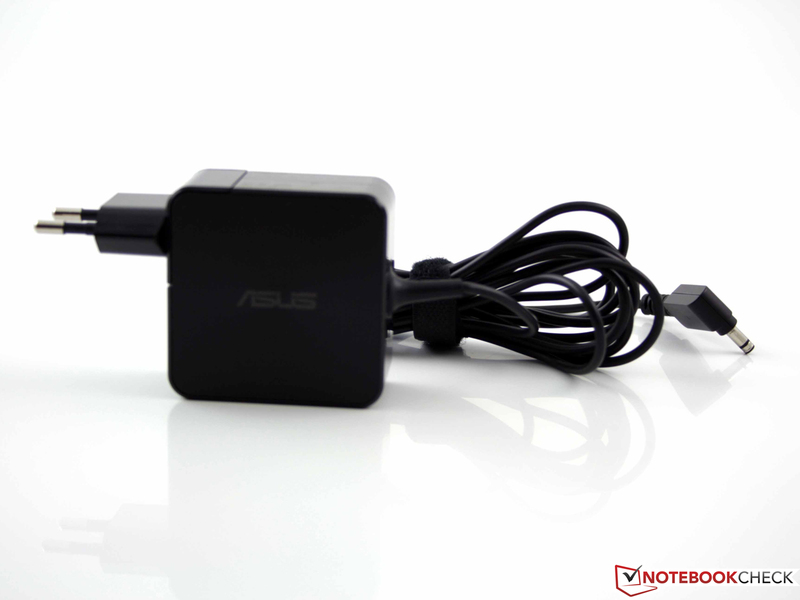 Asus includes a digitizer pen in the box. 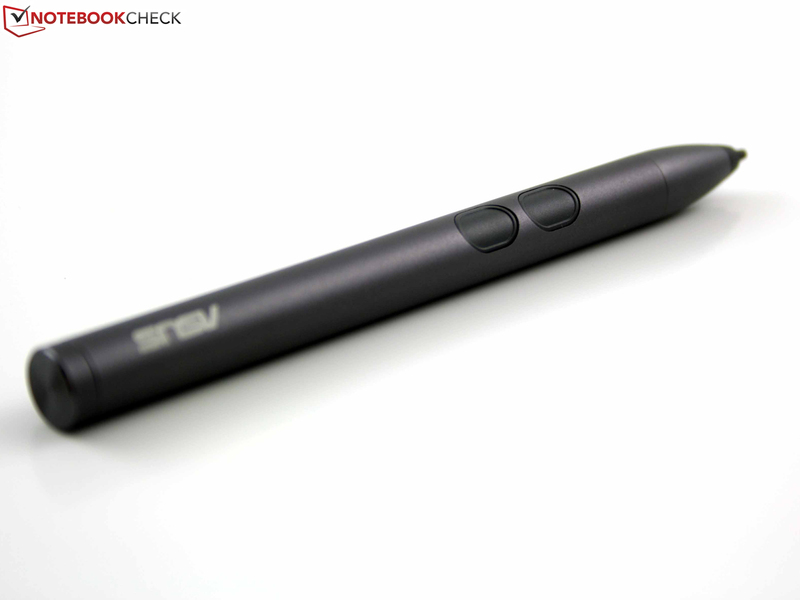 The active pen uses a battery and allows handwritten and above all precise inputs. We deem digitizer and Full HD a perfect match. Due to the high pixel density on the 11.6-incher, the finger is not always accurate enough particularly in compact menus and file trees. 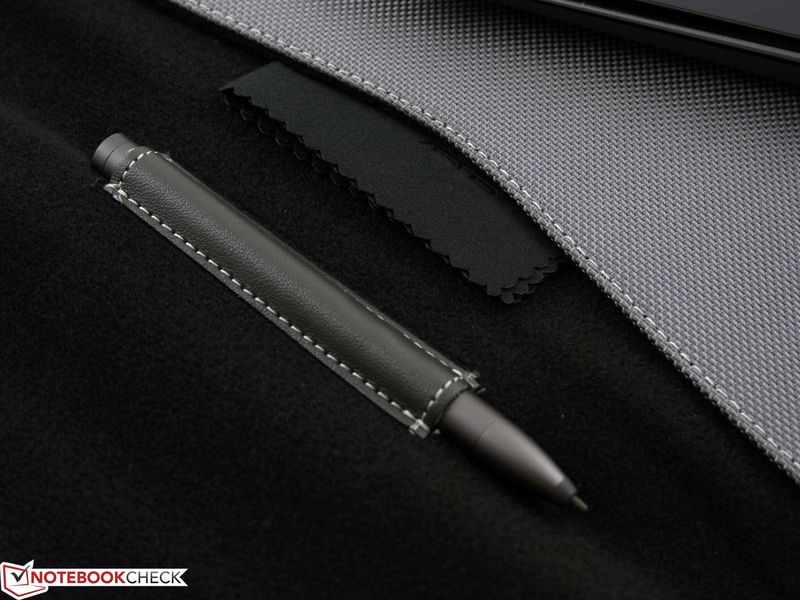 The aluminum pen is comfortable to hold due to its weight (aluminum + battery). However, it cannot be stored anywhere in the device. Again, we are amazed how precisely the screen, or Windows 8, responds to gestures even with the finger. 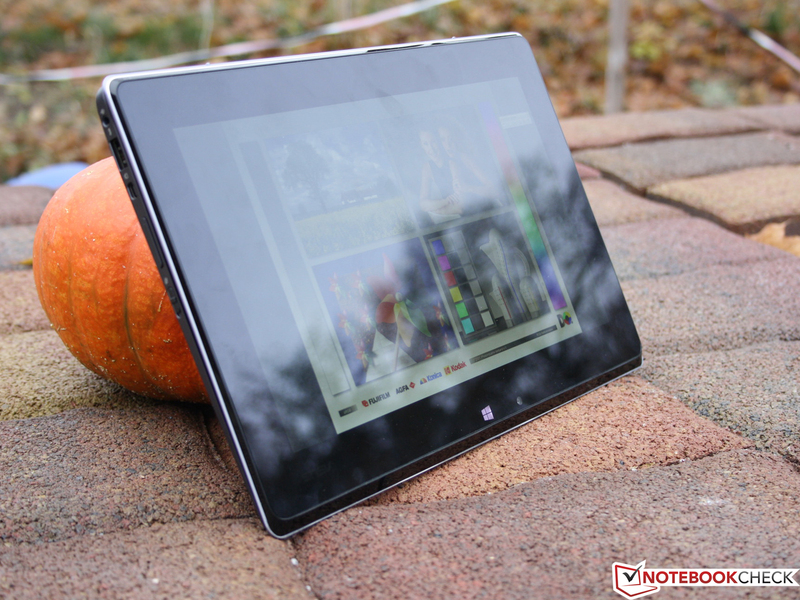 The Windows convertible does not have to shy away from a comparison with a high-end capacitive tablet. An accurate gyroscope aligns the picture automatically. The rotation lock button freezes the position. Both 11.6-inch screens in the Taichi feature 1920x1080 pixels (Full HD). There is also the multi-touch functionality of the lid's screen (capacitive). The screens come from CMN (N116HSG WJ1, IPS) and the touchscreen is not AR coated. 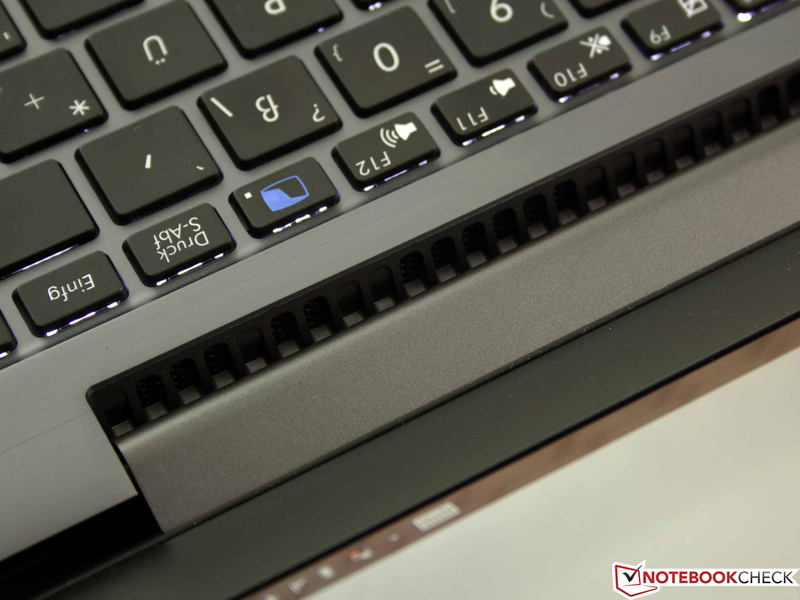 However, the laptop mode features a matte non-touchscreen. Both IPS screens have a high contrast; we measured 1258:1 and 1651:1 (non-touch / touch). 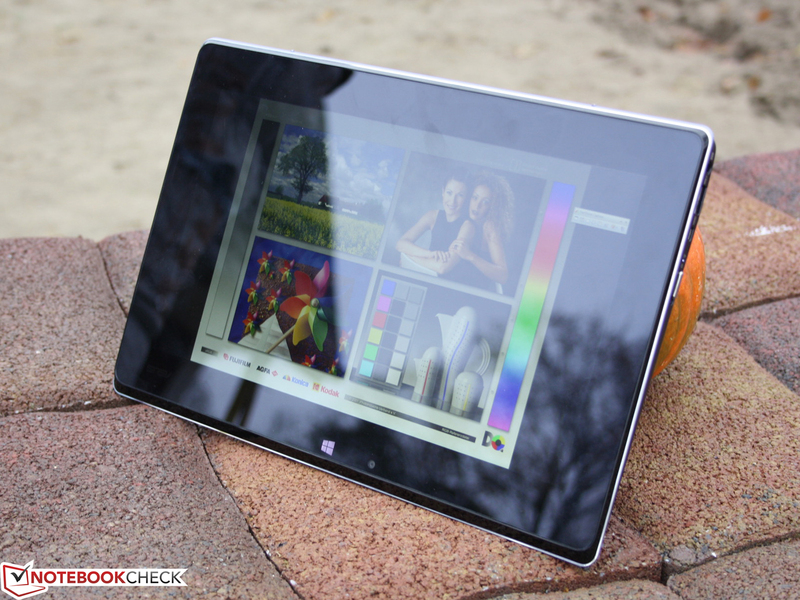 The color quality and viewing angles are comparable to good tablet screens. 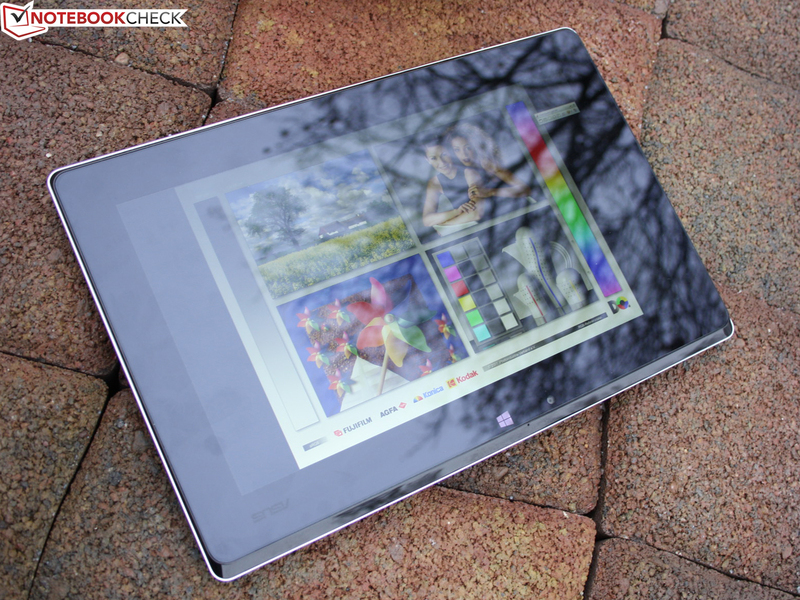 Screens of this quality are found in the Vaio Duo 11 and Dell's XPS 12 contenders. 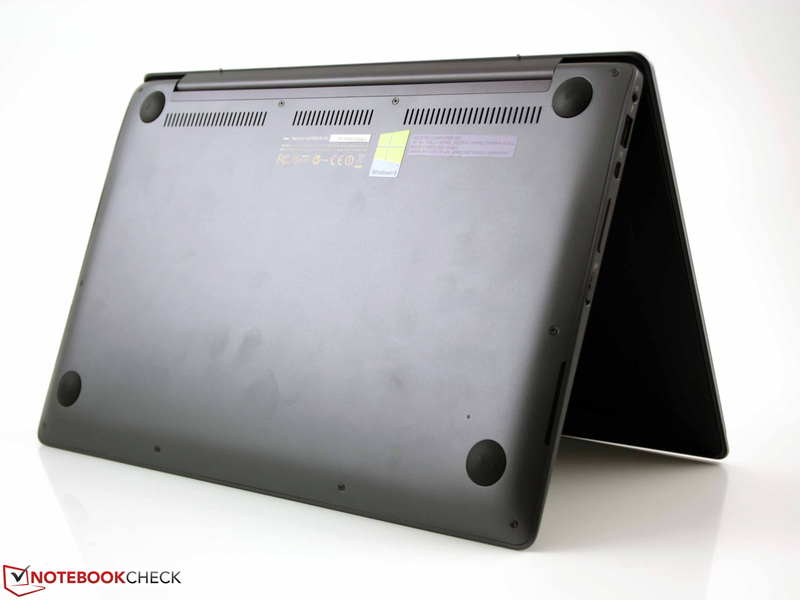 The following clamshell ultrabooks also feature equivalent screens: Asus' ZenBook UX31A (FHD, IPS), Acer's Aspire S7-391 (FHD, IPS), Samsung's Series 9 900X3C (1600x900, PLS) and of course Apple's MBP 13 Retina. The maximum brightness of 223 and 216 cd/m² (non-touch / touch respectively) is in line with the laptop average, which is not beneficial for outdoor use. 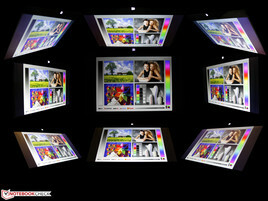 Moreover, the backlight dims to 168 cd/m² on the non-touchscreen. The brightness is not reduced in tablet mode, but luminance is pretty low to begin with. Neither screen achieves the reference color spectrum (AdobeRGB and sRGB). 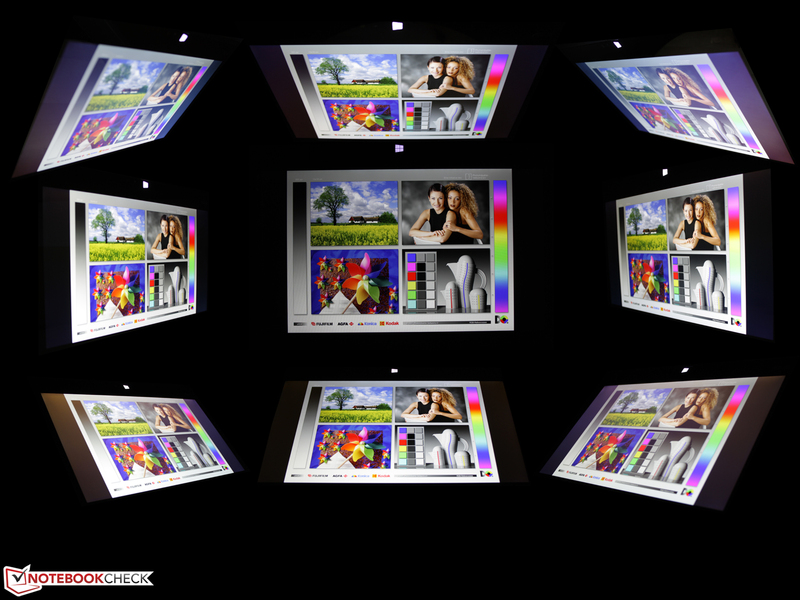 The comparison pictures of the color gamut show that they are very likely identical screens. The varying contrast might be caused by the deviating maximum brightness (center). We compare both Taichi screens in the seventh screenshot and see an almost 100% coverage. 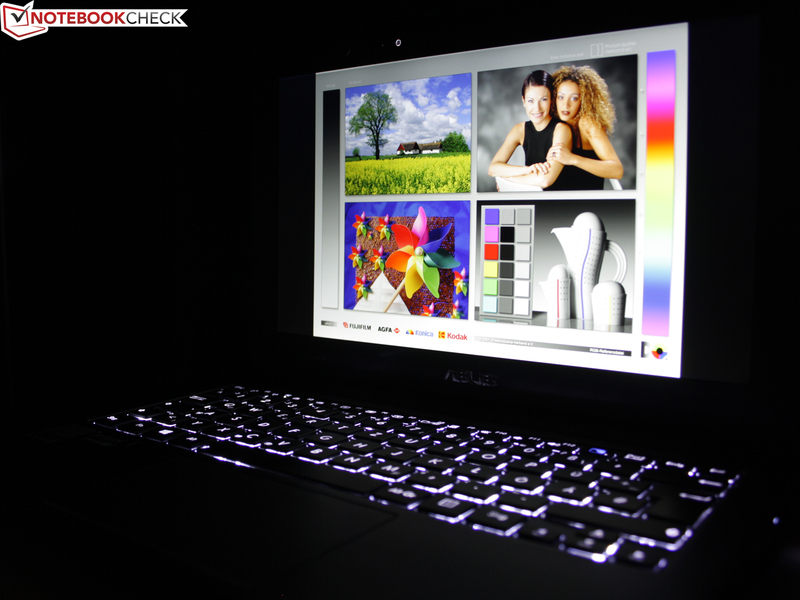 Acer's Aspire S7 offers a much better color space. 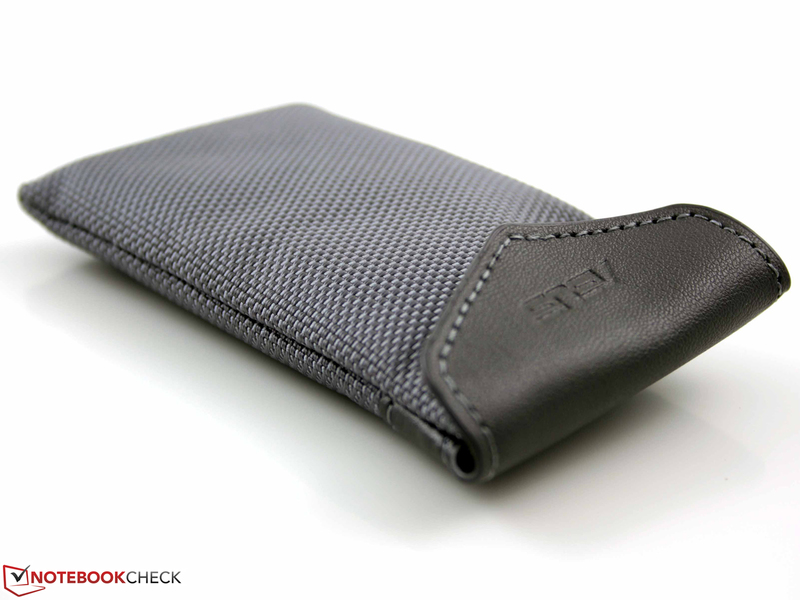 We did not take a picture of the matte inner screen. The somewhat reduced brightness (168 cd/m²) only supplied enough light in the shade or cloudy conditions. We disabled the brightness sensor on both sides (!) for the measurements. The touchscreen did not dim on battery power. Since the brightness is altogether low and the glossy-type screen causes intense reflections, use in the sun could also prove to be difficult here. The viewing angles are great. They are at roughly 85 degrees horizontally and vertically. Common TN displays (twisted nematic) do not go beyond 45 degrees horizontally and 15 degrees vertically. Ultrabook convertibles all featured very good IPS screens to date (XPS 12, Vaio Duo 11, IdeaPad Yoga). 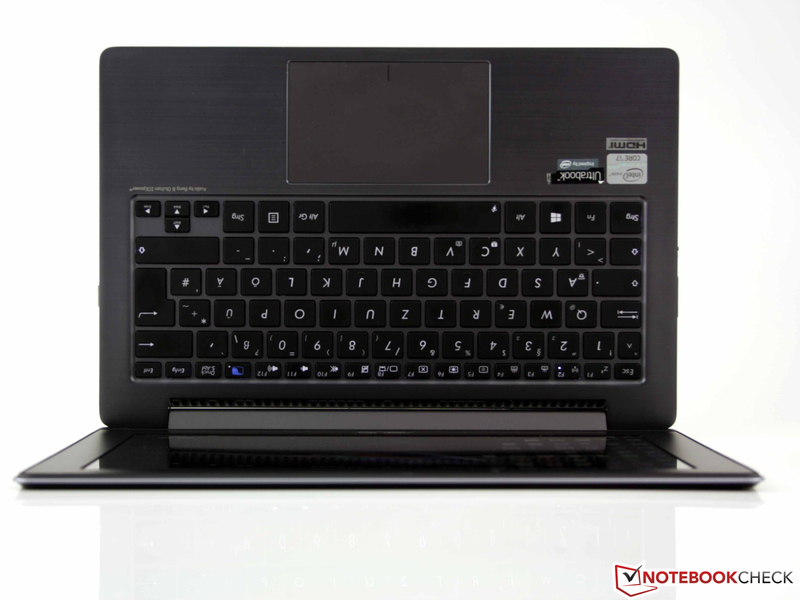 The Core i7-3517U (2x 1.9 GHz) is a swift low-voltage processor for subnotebooks. It currently is at the front of 17 Watt (TDP) ultrabook CPUs and has a higher performance than the Core i3 and Core i5 versions. 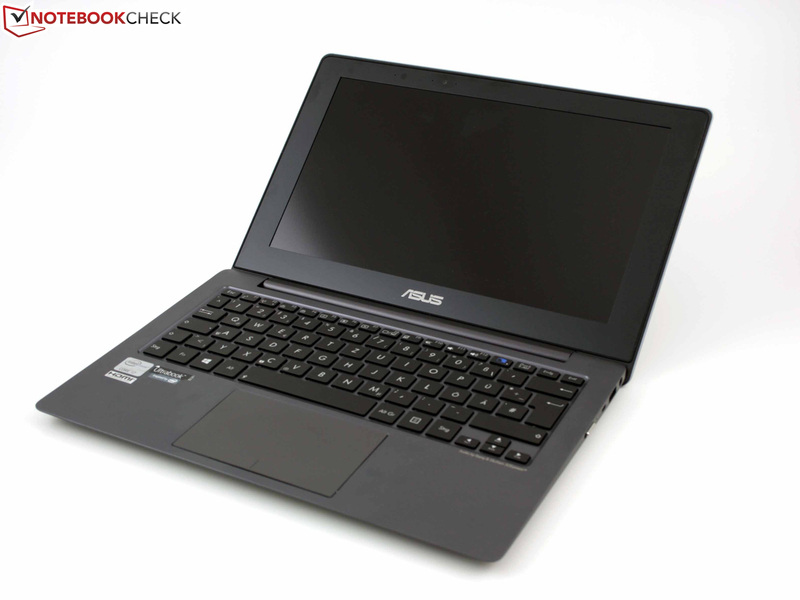 Asus only offers one alternative for the Taichi 21 - an i5-3317U. The clock rate can theoretically be increased to 3.0 GHz, providing that the cooling is sufficient (Turbo Boost 2.0 @ single-core load). The Ivy Bridge i7 incorporates Intel's HD Graphics 4000 and the memory controller for the non-removable 4096 MB working memory. The hard disk is a SanDisk 256 GB SSD (SD5SE2256G1002E SATA III). The i7 version of the Taichi 21 costs a steep 1600 Euros (~$2068). Would a cheaper i5 version for 1300 Euros (~$1680) be enough (128 GB SSD)? The Cinebench tests prove that there is at most a 17% performance difference to the i5-3317U (Vaio Duo 11, MBP Air 11). The XPS 12 with a slightly higher clocked i7-3667U (2.0 GHz) ran even slower in the test (throttling, pre-series BIOS). The user does not have to waive on performance on battery power. The R11.5 tests (incl. OpenGL GPU) finish with the same scores as in AC mode. We ran a Prime95 multi-test and observed that the CPU's clock rate quickly dropped to 2.0 GHz but remained stable at that speed. The Taichi can thus keep a bit of the Turbo Boost (theoretically: 3.0 GHz). The CPU's temperature was 77 degrees Celsius (170.6 Fahrenheit/HWinfo). As we will describe in the ergonomics part, the clock rate nosedives when graphics power is required at the same time. Singly performed GPU tests (pictures two and three, R11.5 Shading) ran with either reduced performance (max. battery life) or full power (max. performance). 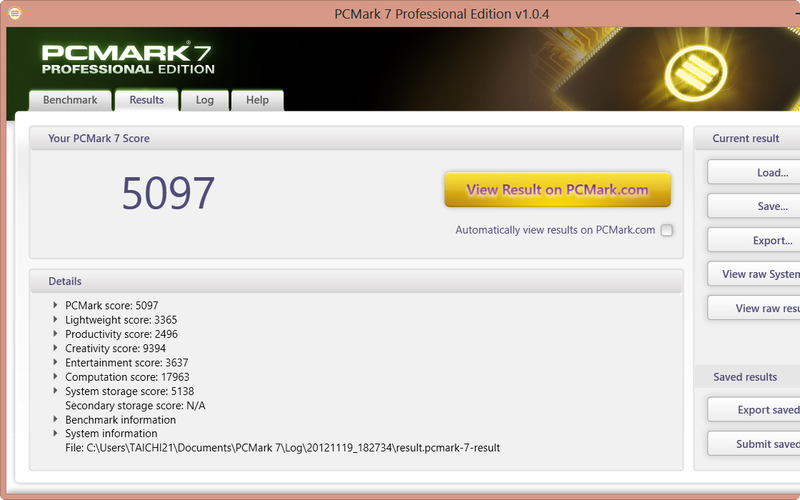 PCMark 7 rates the overall application performance in which the HDD, RAM, CPU and GPU undergo a range of combined tests. PCMark Vantage finished incorrectly and thus we do not supply scores for it. The result excels all expectations with a high 5097 points. The contenders are clearly left behind. 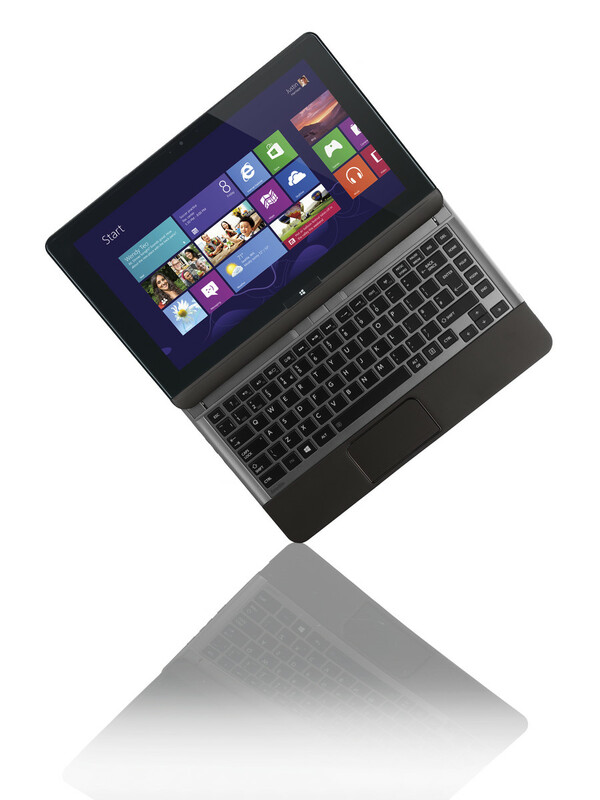 However, the Vaio Duo 11 convertible alongside its Core i5 is surprisingly close to the Taichi (-6%). The reason for this is the Vaio's higher system storage score of +5%. Asus' UX21A featuring the same processor clearly lags behind (-20%). This is due to the comparatively "weak" storage score of SanDisk's U100 128 GB SSD (SDSA5JK-128G-Q). Our Taichi 21 also employs a SanDisk, but the 256 GB SD5SE2256G1002E model (both SATA III). SanDisk's SSD moves data extremely fast over all sectors. At this point, we check whether the high sequential read rates are supported by strong 4K rates. Many SSDs are namely designed for high read/write throughputs for advertising purposes, but neglect the 4K as well as 512K tests which are more important for Windows routine (dispersed, small files). The result is impressive: SanDisk's SSD in the Taichi takes the lead even in 4K. More data about SSDs can be found in the corresponding benchmark chart in the FAQ section. 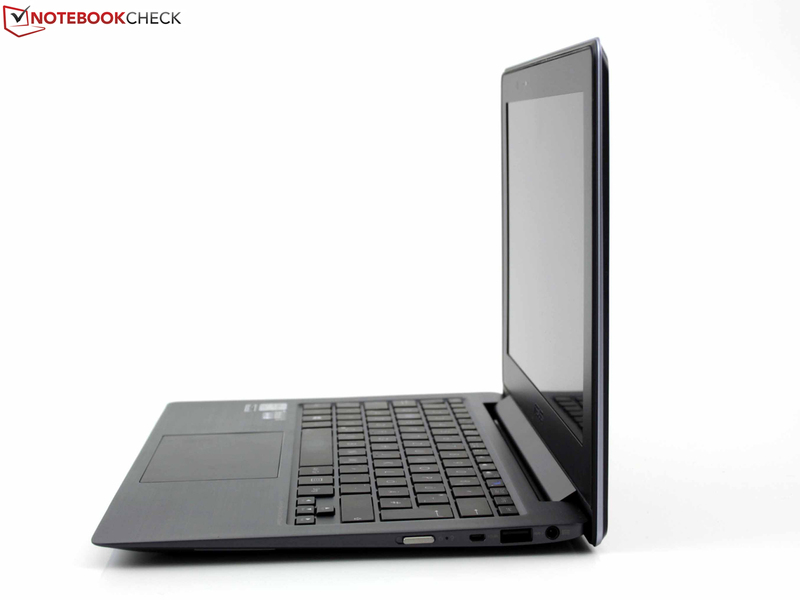 Depending on the CPU, the integrated HD Graphics 4000 is subject to wide fluctuations. More about that can be found in the performance and scaling overview of Intel's HD Graphics 4000. It is dependent on the GPU clock range (here 350 - 1050 MHz) and the cooling system. The Core i7-3517U theoretically enables its HD 4000 to clock up to 1150 MHz; practically, we see the clock at 950 - 1050 MHz in GPU load. This however does not result in a below-average result in the Cinebench Shading test. See the R11.5 OpenGL test above. 3DMark 06 finished with 4415 points. For comparison, the Aspire S7 using the same CPU/GPU scores better with 4953 points. 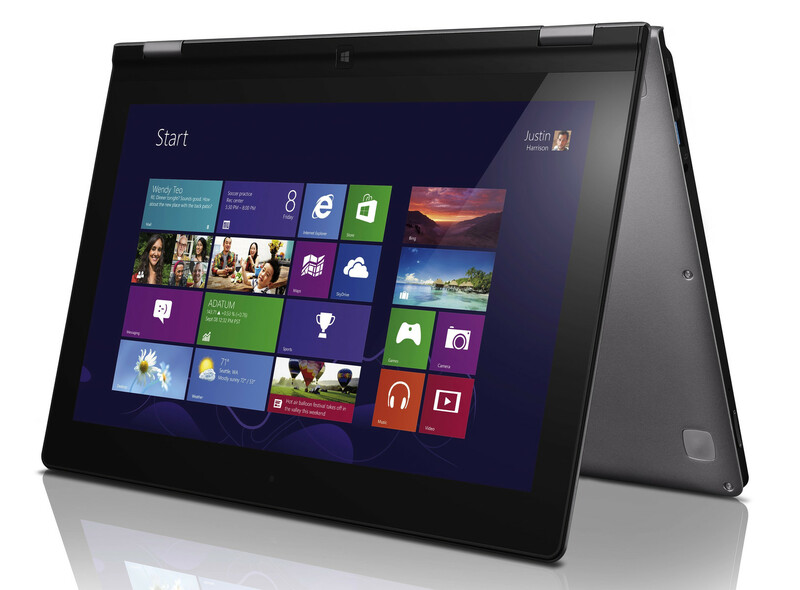 The XPS 12 (-7%), Duo 11 (+11%, i5) and IdeaPad Yoga (-1%) are in its direct vicinity. 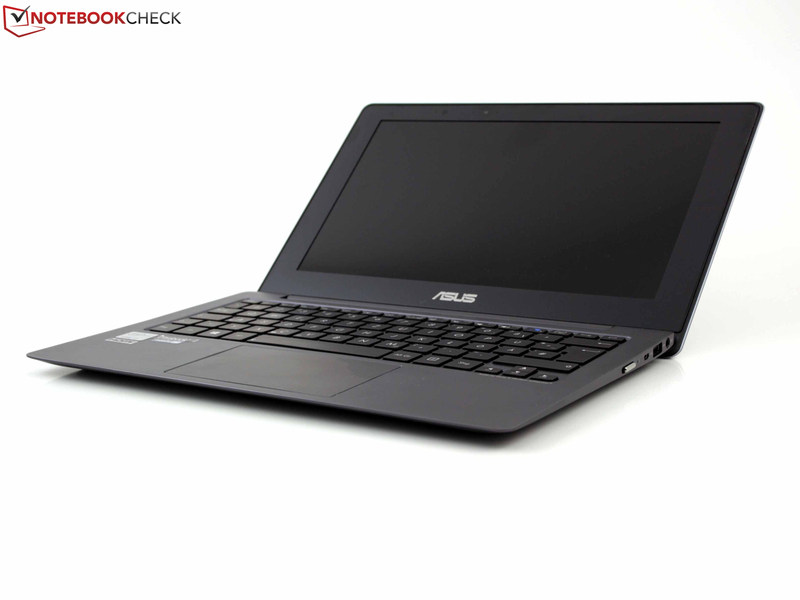 Again, the Duo 11 is noticed positively since it achieves a higher performance with a weaker Core i5. The Vaio does not feature a faster HD 4000; instead, the Taichi's CPU clock glitches when both the CPU and GPU are loaded at the same time (typical for 3DMark 06). See ergonomics / temperature. We perform random tests with up-to-date games and with Risen from 2009. The HD 4000 system is on a very low level. Buyers will have to be satisfied with low resolutions (e.g. 1024x768) and disabled anti-aliasing (low details). Only undemanding games, such as FIFA 13, run smoothly even in medium/high details. The Taichi reaps in very good ratings for its low noise emissions. The waste heat is discharged over the entire width of the base unit's gap below the hinge. The active fan is only off when the casing is still completely cold after booting. But we measure a maximum of 30.8 dB (A) even when the fan spins at its lowest speed at idle. This only changes slightly during longer periods of load or during our stress test. The fan whirs with 36.6 dB (A) in our stress test and with 34.5 dB (A) during 3DMark 06. We measured the noise and temperatures in the opened laptop mode. The temperatures on the keyboard climbed quickly during load and accumulated temperatures of up to nearly 47 degrees Celsius (116.6 Fahrenheit) in hot spots during constant load. This did not look different on the bottom although the rear area around the air outlet was mainly affected here. Such high temperatures do not occur in normal use, such as with a lot of idle and short load periods. The chassis did not always stay as cool as our idle measurement shows, but 30 degrees (86 Fahrenheit) were only marginally exceeded. The cooling system seems to be overtaxed since the temperature of the processor climbed up to 90 degrees Celsius degrees (194 Fahrenheit) in the stress test. This caused temperature-related CPU throttling (clock rate decrease = lower performance). Screenshots one and two nicely illustrate what happens here. The CPU clocked with 2.3 GHz at the start of the stress test, but 90 degrees were reached after only half a minute. The processor throttled to 800 MHz and the temperature consequently dropped to 74 degrees (165.2 Fahrenheit). This effect only occurs to this extent when GPU load is demanded at the same time. A CPU-only stress test clocked stably at 2.0 GHz (see screenshots below "Processor"). A performance decrease was not observed after the stress test (3DMark 06 constant). (-) The maximum temperature on the upper side is 46.6 °C / 116 F, compared to the average of 35.4 °C / 96 F, ranging from 21.8 to 55.7 °C for the class Convertible. (-) The average temperature of the palmrest area of similar devices was 29 °C / 84.2 F (-5.5 °C / -9.9 F). Where did Asus hide the speakers? The two stereo speakers are concealed underneath two long openings on the wrist rest's right and left bottom, like in the UX21A. They supply a midrange-heavy, but good sound in view of the size. The small membranes can only render low ranges and trebles poorly. The user does not have to avoid maximum volume since the speakers do not distort. The audio jack (microphone/headphone combo) located at the side worked flawlessly with two Yamaha speakers (YST-M20SDP). The Wave Maxx Audio Equalizer provides presets for movies, music, speech, etc. and allows individual sound enhancements. The most impressive effect is however only accomplished with external speakers or high-quality headphones. The small speakers only sound ordinary one way or the other. We measured only 7 Watts at idle. The energy-efficient components of the Ivy Bridge generation, the SSD and the rather low brightness are the reason for a maximum idle power consumption of merely 11 Watts (high-performance profile, Wi-Fi on). Similarly configured laptops usually consume a bit less power. The power consumption climbed to 36.5 Watts in load, whereby the identical rates in 3DMark 06 and the stress test is a clear indication for throttling. The stress test requires 41.5 Watts in the first 20 - 30 seconds and then settles to between 36 and 25 Watts. Laptops without throttling always have a higher power consumption in the stress test than in 3DMark 06. Intel specifies a runtime of at least five hours from ultrabooks. Our Asus Taichi misses this target - at least in the practical Wi-Fi test. We only surfed through the Wi-Fi test for 3:15 hours in tablet mode. The brightness was reduced to approximately 150 cd/m², which is the standard brightness for this test. 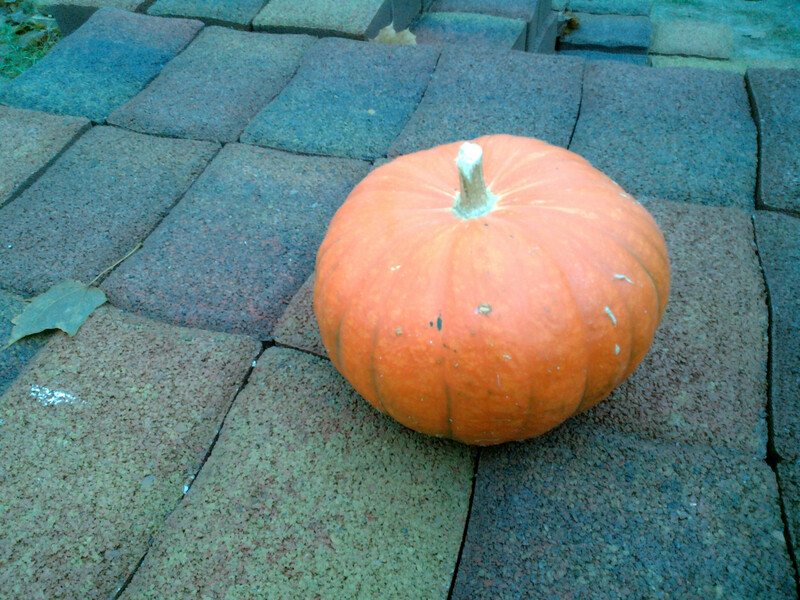 Only the idle runtime test accomplished five hours. After recharging the non-removable 35 Wh battery, the Taichi lasts for 1:17 hours in CPU load (maximum brightness). 2:30 to 3:00 hours pass in idle before the battery is fully recharged. This is annoyingly long in relation to the short runtime. The runtime is a downer when regarding the use of this mobile device. The competition provides more: Sony's Vaio Duo 11: 6:36/3:47 hours; Dell's XPS 12: 9:38/5:34; IdeaPad Yoga: 6:25/4:29. The Taichi could be revolutionary - it can in fact revolutionize using a Windows PC. Of course, the user has to be open for this and the high-end convertible makes that easy. But first things first. 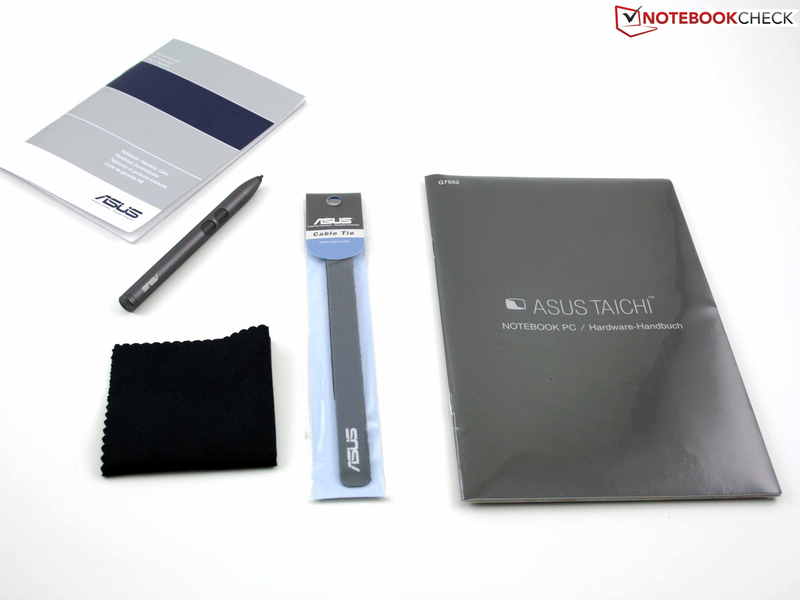 The Taichi 21 is almost on a par with the ZenBook category in terms of technology and workmanship. The aluminum unibody base unit is exceptionally stiff; the dual-screen lid cannot match that for construction-related reasons. 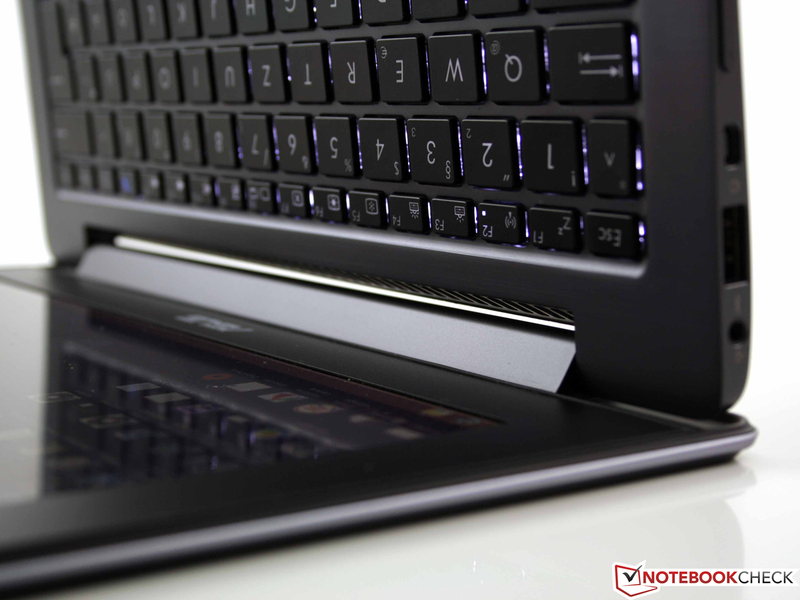 The partly minimized ports (VGA, HDMI) and the omission of both a card reader and Ethernet are known from the smallest ZenBook UX21A. An adapter for RJ45 and VGA d-sub is included. 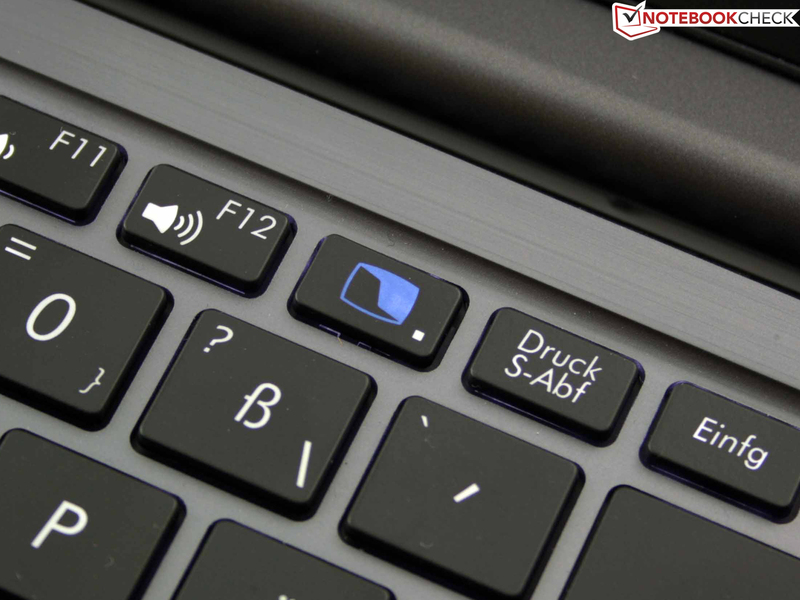 The input devices, keyboard and touchpad, operate on a very high subnotebook standard and also includes the multi-touch input on the TFT. The mobility does not prove to be quite as perfect due to the fairly weak battery and brightness reduction (168 and 213 cd/m²). The battery is drained after a good three hours of Wi-Fi browsing (tablet mode). Working on the matte screen (laptop mode) is just as fun as on the touchscreen. The reason: Asus installs identical FHD-IPS screens on both sides. Both not only feature excellent contrasts, but also generous viewing angles. The Windows display is only inferior to high-end screens in terms of brightness. 223 or 216 cd/m² is the maximum in AC mode. The Core i7 processor suffers under CPU throttling during high load, thus when the GPU is also loaded. This is not noticed in basic applications (MS Office, Internet, etc.). On the other hand, the SSD memory accomplishes very good application performance that would not be expected in this form from an 11.6-incher. 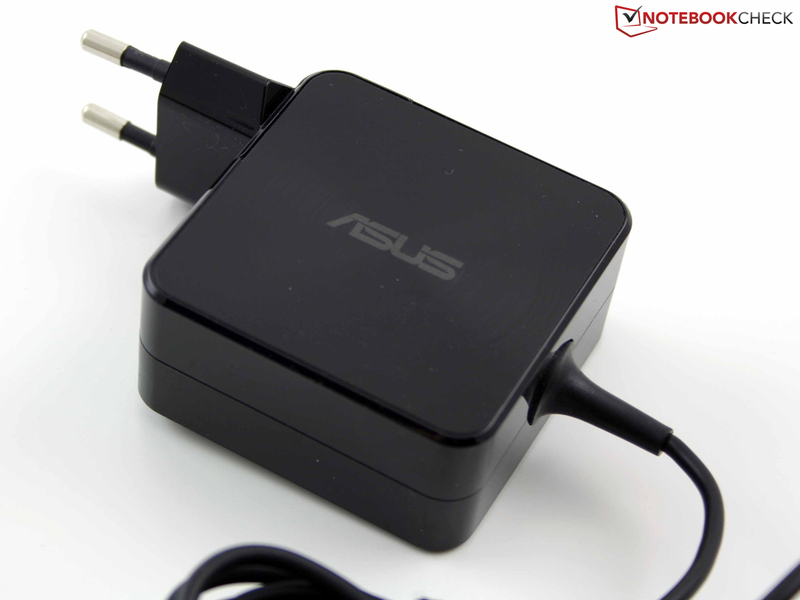 We tried the operational modes and confirm that Asus has implemented good ideas into practice. The special Taichi button on the keyboard opens required functions and switching does not take long. 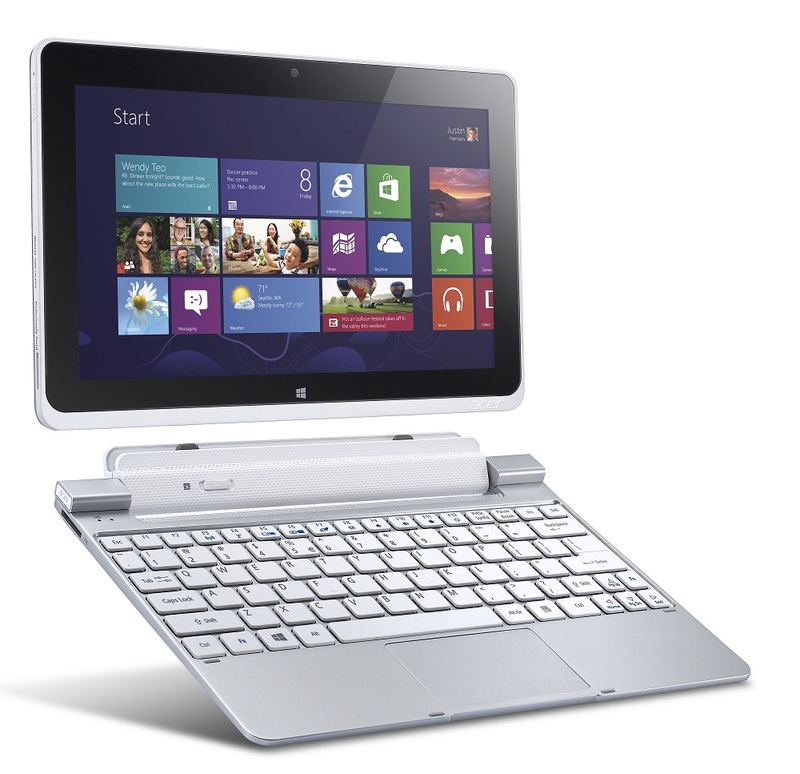 The tablet unfortunately does not sport a rear-facing camera (see Sony's Vaio Duo 11). 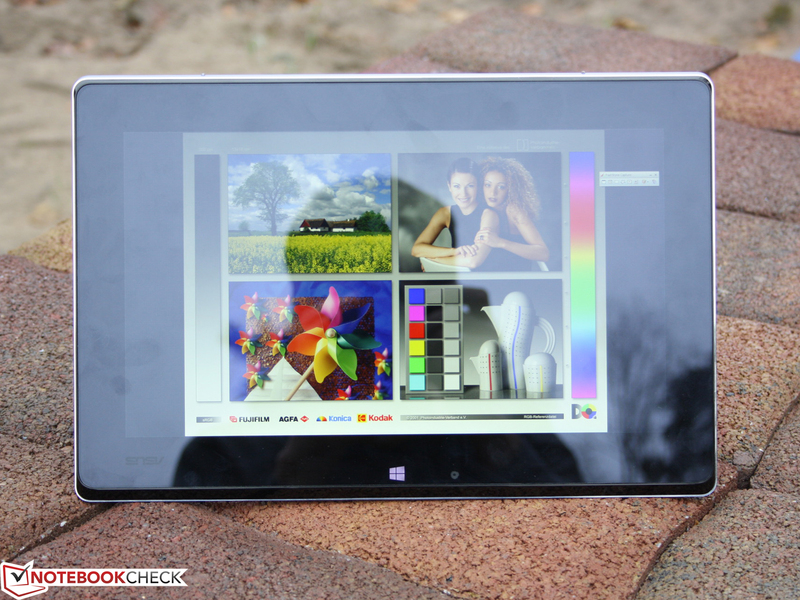 The 5 megapixel model is the front-facing camera in tablet mode. Regrettably, the image noise is too heavy for high-quality pictures in daylight. 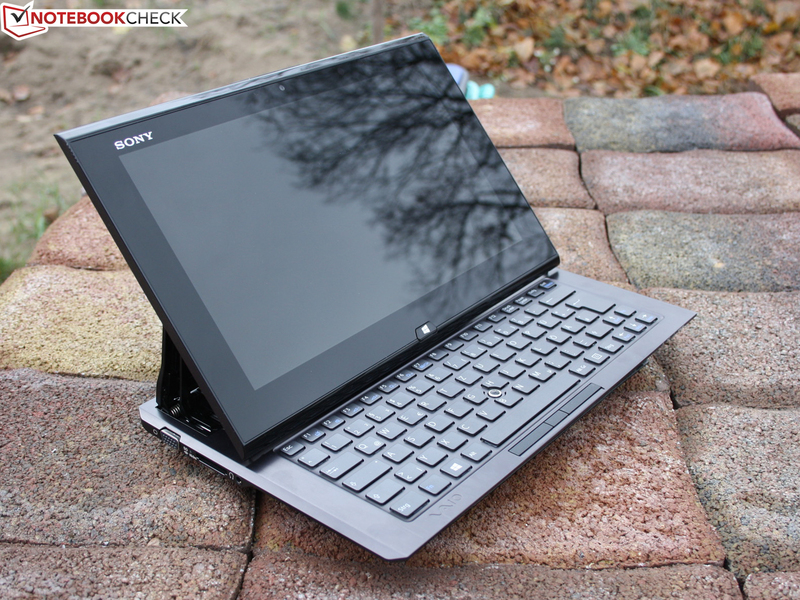 We deem Sony's Vaio Duo 11 as the best alternative to date. 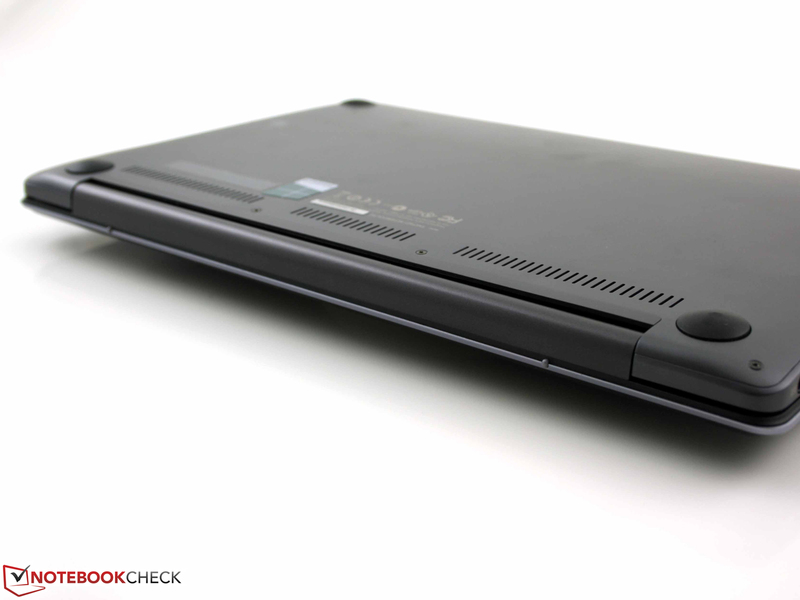 The Vaio cannot be used in all scenarios, but it offers a better battery life (+ battery slice option), full-size ports and a superior camera. A strong IPS touchscreen and a digitizer pen are also included. Asus Taichi 21: The convertible solution with the least mechanics. as well as a digitizer pen in the box. The battery only just exceeds three hours. This is not due to the Core i7, but rather because of the weak 35 watt hour battery. 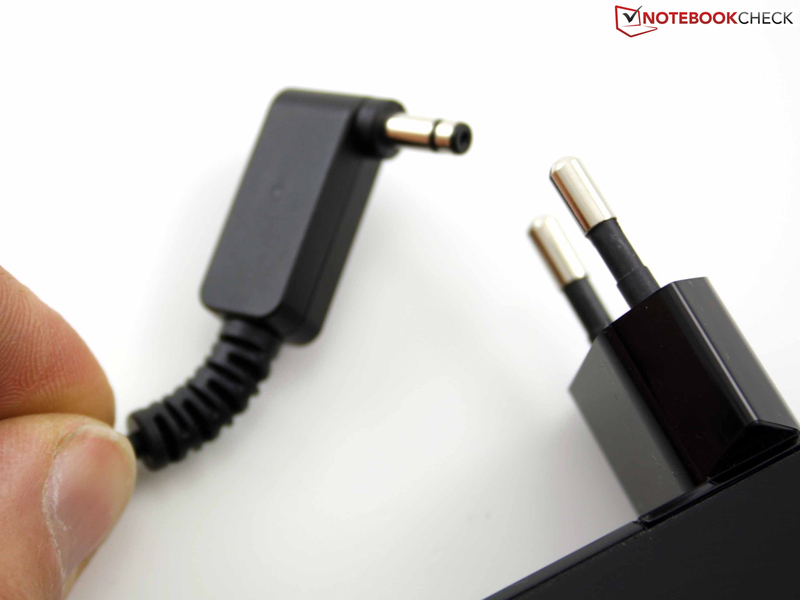 The handy PSU is designed as a connector solution (187 grams). 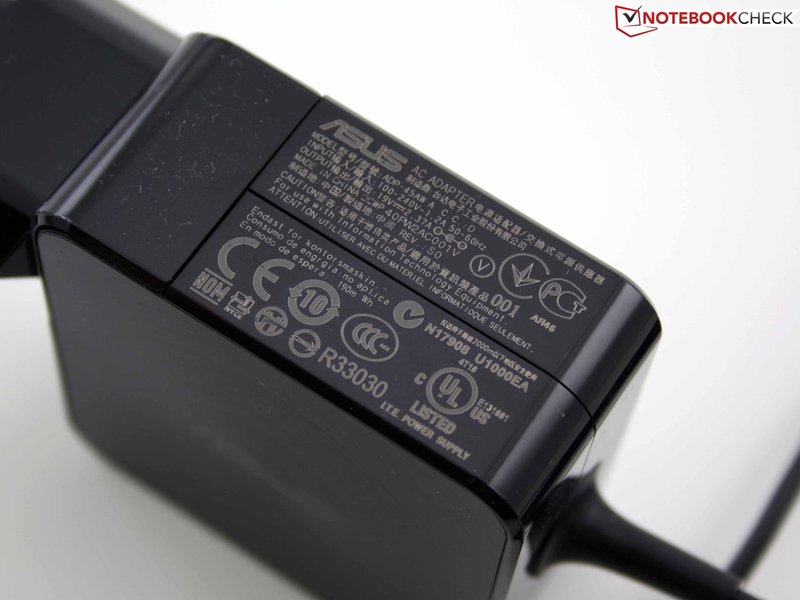 Asus also largely used high-gloss surfaces, which is inappropriate for a PSU. 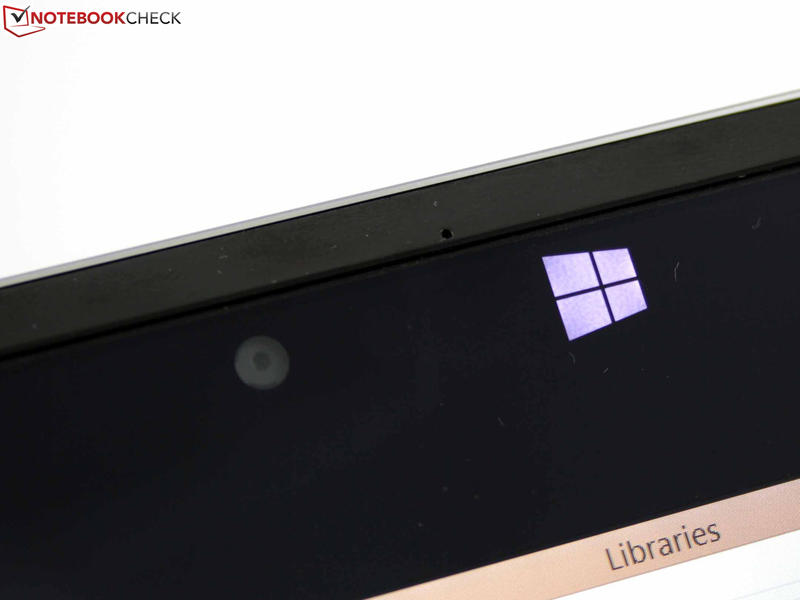 A brightness sensor is placed between the webcam and Windows button (both sides). The power button (slider) is on the devices side (for tablet mode). 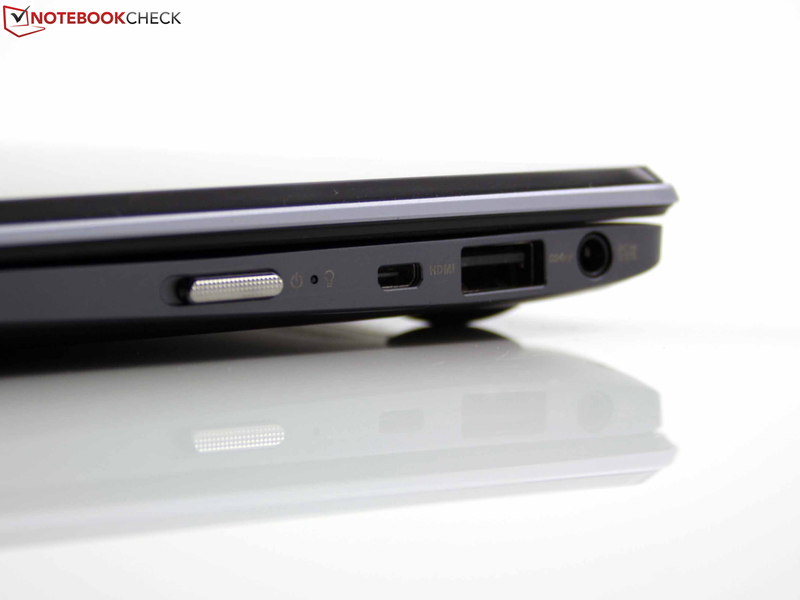 Like in the ZenBooks, the air outlet is below the hinge. Asus Taichi 21: Two very good IPS Full HD screens. Asus Taichi 21: Good implementation of the dual-screen mode in the practice (Taichi button). 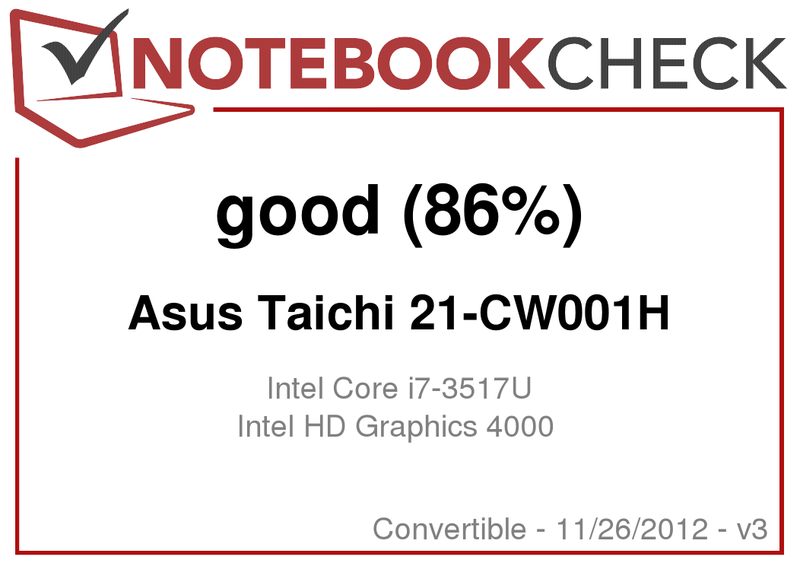 Asus Taichi 21: Core i7 performance with throttling issues (only noticed in maximum load). The pressure point is crisp and the drop sufficiently long. you will buy a so-called convertible nowadays. 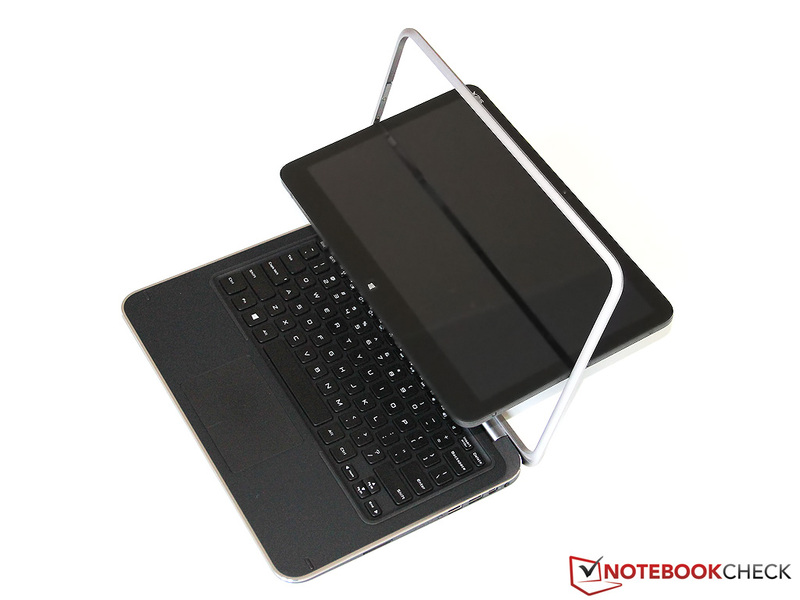 The various mechanical solutions let a subnotebook mutate to a tablet. Asus does not use complicated hinges and keeps it traditional. mutates to a tablet PC in a closed state. You can type and show productively in an opened state (touchpad). The lid is bigger than the base unit (+3 mm). A number of usage options are possible which first become obvious at second glance. for the feedback strong input devices. 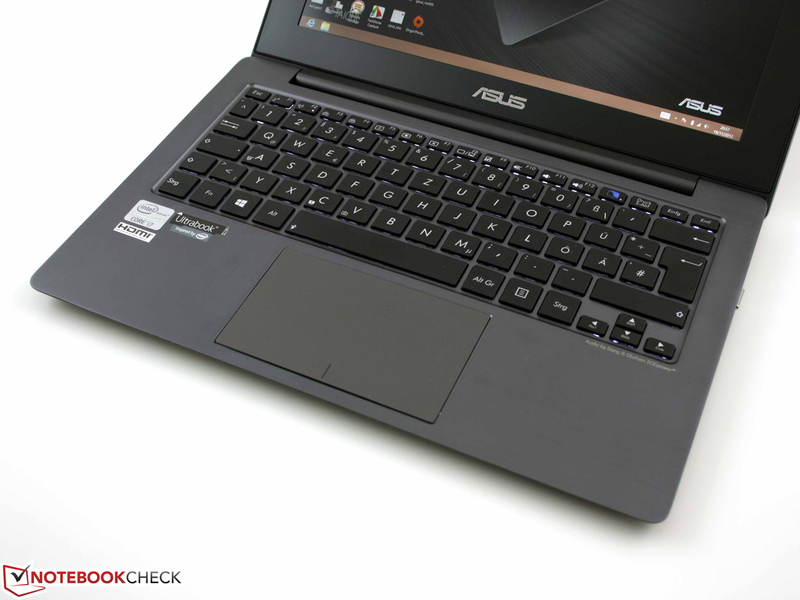 Asus Taichi 21: Workmanship on ZenBook standard. Two perfect IPS screens and one is even AR coated. Input devices with such good typing feedback are rare. Apart from a higher brightness, only a longer battery life. Throttling in the stress test. The ZenBook UX21A (11.6 inches) featuring the same CPU in an equally slim casing did not exhibit this problem.